TAUNTON, Mass. 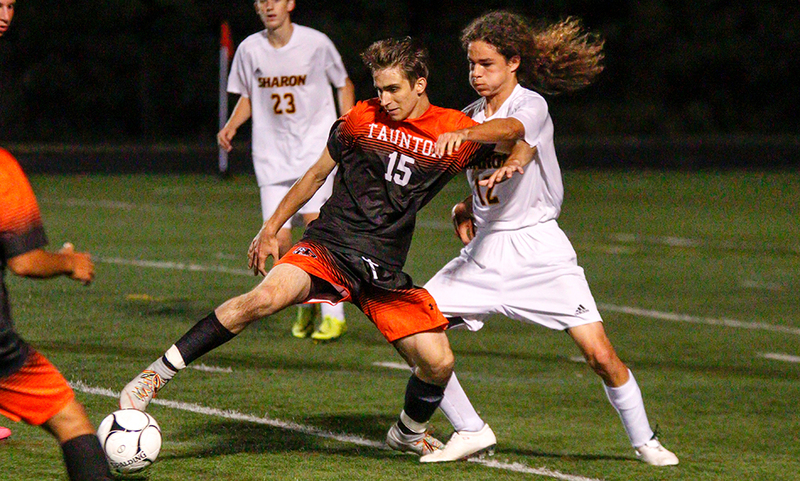 – The Taunton boys soccer team didn’t win the battle of possession or have the most chances in the game, but it did have the advantage where it mattered most: the score. The Tigers weathered a strong attack from Sharon, countering with two second half goals, including the game-winner in the final five minutes, to pick up a 2-1 win. “For this team, it’s about a belief system,” said Taunton head coach Taylor Whitters. “They have to really believe in what they are capable of, because they are capable of a lot, this team has a lot of talent. It’s about being confident. This team in particular, they don’t give up. They are really embracing the “we” mentality over “me” and I think thats’ carrying them through. With the game tied 1-1, Taunton senior Brett Beaulieu won a one-on-one battle on the left flank, dribbled into open space and drove a perfectly weighted cross into the senior. Junior Mateusz Hagemajer was in the right spot, heading it just under the bar through the keeper’s hands for the game-winner. Sharon had the majority of the play, especially in the first half. The Eagles applied a ton of pressure in the opening 20 minutes but couldn’t solve the Tigers’ defense, anchored by Evan Melo and Liam Crowley, or goalie Nolan Melo (10 saves). Senior Antonio El-Khoury had a nice rip from 25 yards out sail just over the bar, junior Isaiah Stessman drove a low shot from the top of the box off the post, and the Eagles had a couple of crosses go without an answer. The Eagles finally broke through in the 26th minute when Stessman tucked a header just inside the far post off a nicely taken corner from senior Eli Berkowitz. Before the end of the half, Taunton settled in some and developed a pair of chances on their own. In the 33rd minute, Hagemajer hit a half volley that was smothered on the bounce by Sharon keeper Ethan Kantor. Five minutes later, hard work from Jared Roderick nearly led to a chance for Hagemajer in the box but Sharon’s Daniel Gunduz interjected and cleared. After some back and forth play in the early second, Taunton came up with the equalizer just over the midway point of the half. Beaulieu came up big again, gaining possession just over half and linking up with Colby Fernandes in the final third. Fernandes took a touch into space before taking a shot from 25 yards out. The shot deflected off a player and hit off the inside of the post, just outside the reach of the diving keeper, to make it 1-1. It was Beaulieu’s first of two assists on the night. Sharon nearly responded right away when Berkowitz was played in alone in the 67th minute but Melo made a terrific one-on-one stop to keep the game level. Eight minutes later, Hagemajer had the winner. “It’s deflating. We completely dominated that game, dominated the chances,” said Sharon head coach Bryan Kelly. “I’m in shock…we stopped running the last 10 minutes of the game. It was unlucky [Taunton’s] first goal took that deflection. But a break like that gives a team like that hope. We’re not a bad team…I know we’re 0-3-3 but we’ve dominated almost every single game we played. Taunton boys soccer (1-1-2 Hockomock, 1-2-2 overall) is back in action on Monday night when it visits Franklin. Sharon (0-2-3, 0-3-3) is in action the same night, taking on Canton in its first ever night game at Sharon High.